In a fit of what now appears to have been madness, over the last ten days I attempted to live the life of a small plastic figure in an architect’s model community. I wheeled my bike through railroad stations, and took eco-friendly cycle lanes. The goal was to use only a combination of trains and my bicycle to attend a series of meetings in France, Belgium, and the Netherlands. I hoped that the harmonious state of the European Union, not to mention the environmental friendliness of both trains and bikes, would allow me to whiz between Bordeaux, Paris, Brussels, and Amsterdam and then pedal the last kilometers to my hotels. Is this not the dream of European planners who have banned cars from many historic downtowns, and annually vote some €40 billion a year in railroad subsidies? Like many utopian schemes, my model week of travels worked better on paper than in practice. I made a large loop from Geneva to Bordeaux, Paris, and Amsterdam, and stopped long enough in many other cities to ride around the “centreville”. When it was over, I came to the conclusions that European rail transport, and perhaps even the larger European Union, remain Balkanized, and that taking a bicycle on a business trip involves the same logistical planning as departing on a Crusade. While getting on and off thirty trains (on the weekends I made detours to historic sites), I learned that many European railroad companies hate bicycles, especially on crack express trains, and that bikes are largely exiled to insignificant “milk” trains that go nowhere at slow speeds. More distressing, national borders — largely in disuse on auto routes across Europe — are alive and well whenever you attempt to bring a bicycle across state lines on a train, as that opens up the possibilities of more fees for rail companies, or at least the chance for conductors to deliver nationalistic rants. France: Bikes are allowed on some high speed TGV trains (Train à Grande Vitesse), but only after a passenger has physically gone to a station and paid for a reservation. Online bike reservations are not possible (that would make it too easy). Local TER trains (Transport Express Régional) welcome bikes aboard at no extra charge and have convenient hooks and bike carriages. Except for a few long distance “Intercités” trains, TER is local, which is why it took twelve hours and numerous train changes to travel with a bike from Geneva to Bordeaux, the first leg of my journey. I changed in Bellegarde, Lyon, and Saint-Pierre-des-Corps before heading to Bordeaux. Later, I made whistle stops in La Rochelle, Poitiers and Tours. Nearly all the cities on my route were a delight to see on a bike, as, of course, was Paris, which is as bike-friendly as any large city, although Parisian cyclists ride as though they inhabit some wild Expressionist painting. Belgium: I went from Paris to Lille and then across Belgium on several trains, all of which took my bike, but few of which had any place to store it. Nor is the French fee paid to transport a bike recognized in Belgium. So much for the common market. Belgium imposes its own set of arcane rules for passengers trying to sneak a bicycle across the border. Even though I had passes for the trains and my bike, there was always some reason I ran afoul of the Belgian conductors, who in torrents of Flemish, French, or English would berate me for the temerity of traveling in their country. Mao would have called these encounters “struggle sessions,” and I grew to dread being asked for “self-criticism” every time I boarded a Belgian train. A few of the conductors were kindly, but some in Flanders were so bitter over what appeared to be nothing that I wondered if their rage wasn’t part of a larger crackup, maybe one involving the entire country? I did love my rides around Brussels, Antwerp and Ypres, but was shocked at the contrast between wealthy (Germanic) Flanders and depressed (French-speaking) Wallonia. Flanders has wealthy farms, an industrial base, global trade via the Rhine, inflowing tourist dollars from Bruges and Ghent, and the European Union in Brussels. Wallonia is the dowager of a forgotten Belgian empire (maybe lost in the Congo?) — with abandoned coal mines, lots of subsidies from the north, lazy union work rules, and a sense that the future isn’t what it used to be. It does not even have Brussels, which floats along the uneasy divide: linguistically part of Wallonia; legally attached to Flanders. If the Flemish politicians are anything like their train conductors, I can easily imagine them throwing the Walloons off at the next station, with a long lecture about their failures as an economic entity or their lack of sufficient documentation. 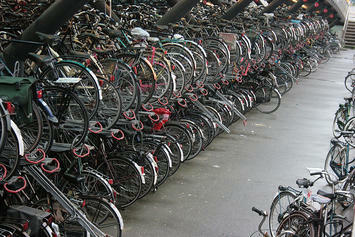 The Netherlands: The Low Countries are celebrated for their bicycle culture; bikes in Amsterdam careen like split atoms. That affection ends at the doors of the train, on which bikes are a regulated industry. I loved biking across the bridges over Amsterdam canals, especially at night when the Christmas lights were lit and the city had the feel of a Venetian carnival. Nevertheless, on the rails, a bike became an albatross, subject to myriad rules about the difference between a “national” and “international” bike pass, and regulations that prohibit bikes on certain trains during rush hours. Because of a tunnel fire, my bike and I were waylaid in the Hague’s damp air for more than an hour. When finally rerouted to Gouda and Rotterdam, I was told in a scolding manner that I would have to get off the trains for another two hours during peak travel times, even though the cars were empty. So much for those newspaper articles about modest Dutch royalty tooling around the country on their bikes. It took almost eight hours to travel with the bike from Amsterdam to Lille, France. These cities are three hours apart on high-speed trains, although none of those trains allow bicycles. The answer to these frustrations, of course, is for me to buy a folding bicycle — although a good one costs more than $1500 — if I wish to persist in the dream of getting around Europe by train with a bike. A “folder” may be worth it, however, because European cities are best seen over handlebars. Sadly, while a folding bike can be snuck aboard fast trains as “normal luggage,” the other, perhaps larger problem of the European bike-train dream is that international train journeys have become the travel choice largely of the expense-account crowd. For example, one-way train fare from Geneva to London is $350, but don’t even think about taking along a bicycle. Or, you might get it from Geneva to Paris on a TGV (add $15 more to the ticket), but Eurostar’s bike policies (add another $35) are more arcane than the Treaty of Westphalia: Bikes over a certain size go as registered luggage, but sometimes travel on different trains, making connections convoluted. So fly, rent a car, sit in traffic, and sleep in motels near auto route interchanges. In other words, so long as you don’t try to see the continent with a bike and by train on the same trip, or on a budget, the state of the European empire is fine. Matthew Stevenson, a contributing editor of Harper's Magazine, is the author of Remembering the Twentieth Century Limited, a collection of historical travel essays. His new book, Whistle-Stopping America, was recently published. Flickr photo by K Paulinka: Bike Storage at Leiden train station parking lot, Netherlands. Submitted by Matthew Stevenson on Mon, 12/16/2013 - 11:27. Yes, it is easier to take a gun on Amtrak (I'm not kidding) than a bicycle. Sadly the only solution in the US is something like a Bike Friday that folds up into a small, non-bike bundle. European trains can work well with bikes, provided you are on holiday, plan ahead, get all the documentation (like trying to export nuclear waste) lined up, and don't try to change trains too many times. But how many of us like like that? The only idea of trains is that you need something to get from the station to where you are going? Car sharing is good, but I prefer two wheels. Will look into the Danube. Thanks. Submitted by PhilBest on Tue, 12/17/2013 - 03:36. Believe it or not, many times when I was younger, (and didn't own a car) I took a spaceframe Moulton on trains. It still made a large pair of "bags" to carry but no conductor ever gave me a hard time. Took longer than a BikeFriday to disassemble, of course. I had it down to a couple of minutes. I still have a spaceframe Moulton (my third) but sadly, health issues curtailed my ability to do much physical exercise from the age of about 35 onwards.